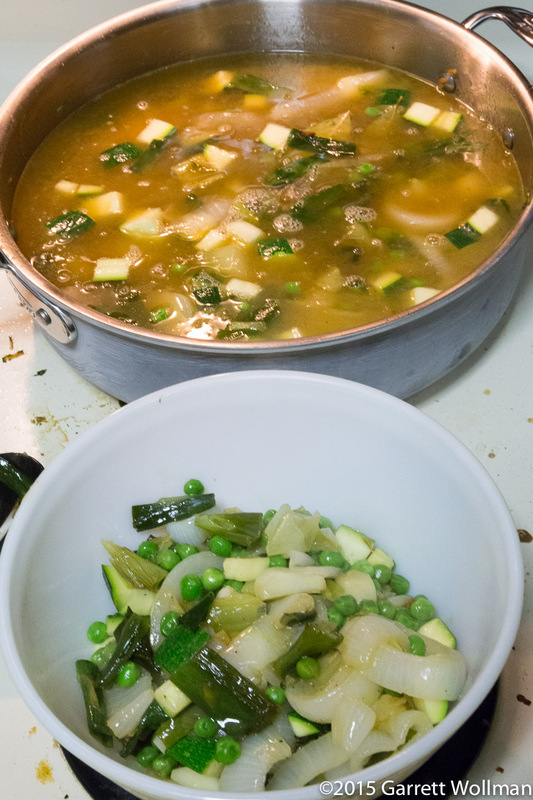 As promised a few days ago, on Sunday (which was, by the way, a beautiful spring day, on which I got both an hour’s walk and a twelve-mile bike ride) I made a vegetarian soup from Yotam Ottolenghi’s Plenty More (Ten Speed Press, 2014). 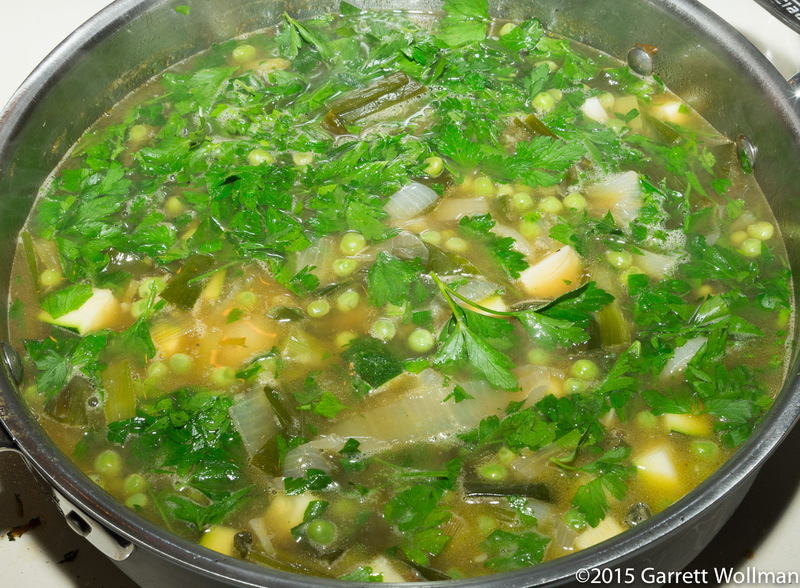 Specifically, I made “Green Onion Soup” (p. 87), a creamy, filling soup made with lots of onions, peas, squash, and the Iranian dairy product kashk. Thankfully, Ottolenghi provides an alternative to kashk in the (altogether likely) event that it cannot be found in one’s local market. Also a word about units of measure: it’s pretty clear that this recipe (like most if not all of the recipes in this book) was written for an audience accustomed to metric measures. To the extent feasible, I’ve followed the metric rather than customary units. Since this is usually more accurate and more convenient, you should do so too. Now on with the preparation! No doubt there’s a lot of preparation work involved in this recipe. In fact, I think the cooking time is probably less than half of the prep time, when you take into account cleaning and slicing the onions, peeling and slicing the garlic, and especially stemming the parsley. 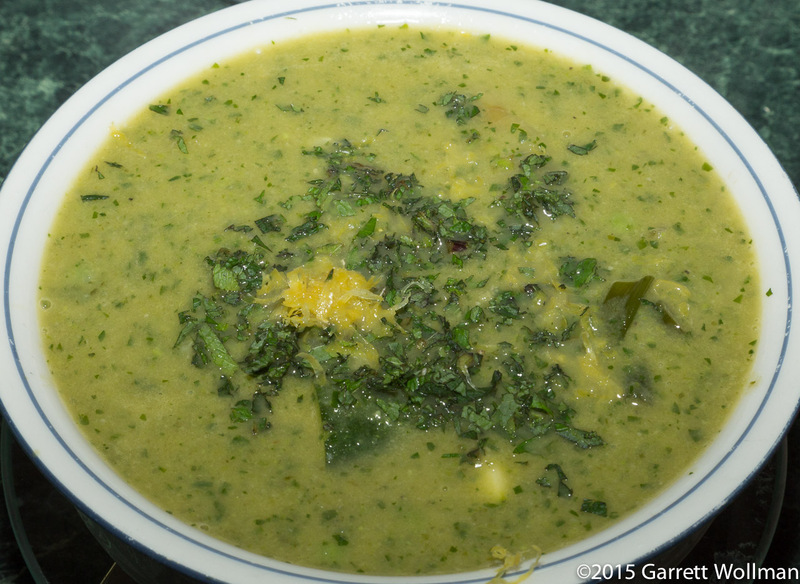 Almost that entire bunch of parsley goes into the soup, as does a whole bag of frozen peas (plus a little bit of a second bag), all nine spring onions, butter, olive oil, zucchini, vegetable broth, and the kashk substitute made from crème fraîche and ground Parmigiano-Reggiano. Not shown: three bay leaves. The first step in the recipe is to separate the onions into “white” and “green” parts, and then slice each into chunks (1.5 cm long for the white parts and 2.5 cm for the green parts). I considered “green” to be any part of the onion that was hollow inside, and “white” to be all the other bits, regardless of their actual color. Ottolenghi calls for two whole heads of garlic, cloves separated, peeled, and cut in half. 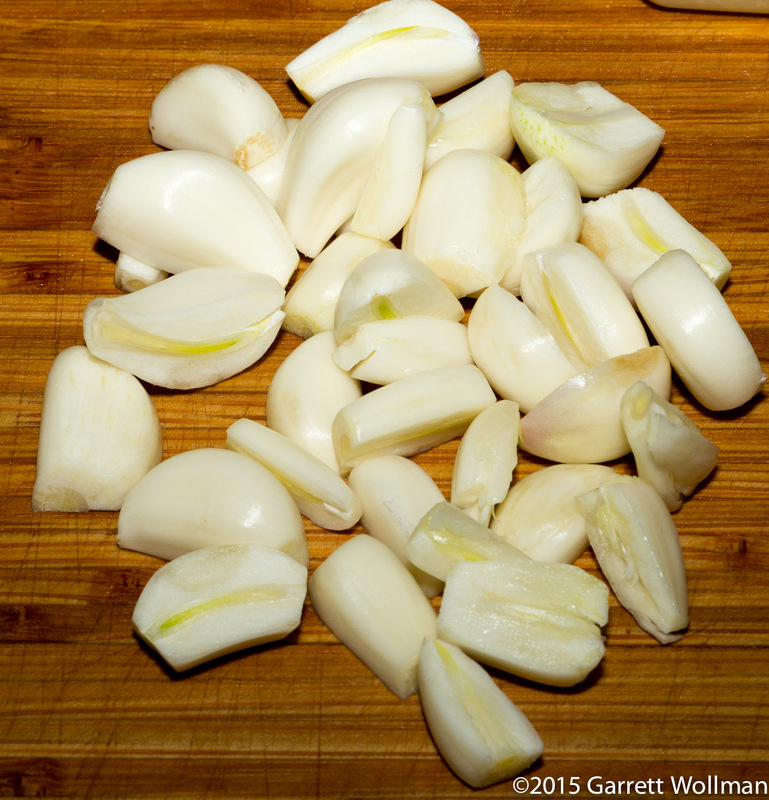 He helpfully provides a quantity, 60 grams, and after I went to all the effort of breaking up and cleaning the garlic, I found that I actually had about 80 g of garlic, so I chopped the remainder and put it in some olive oil to steep in the fridge. The base of the soup is made from a multi-stage sweat. This is pretty familiar to anyone who’s cooked a lot, or even just watched cooking shows: ingredients are added to the pan at different times because they require different amounts of cooking, with the goal being for everything to be completely cooked at the same time. 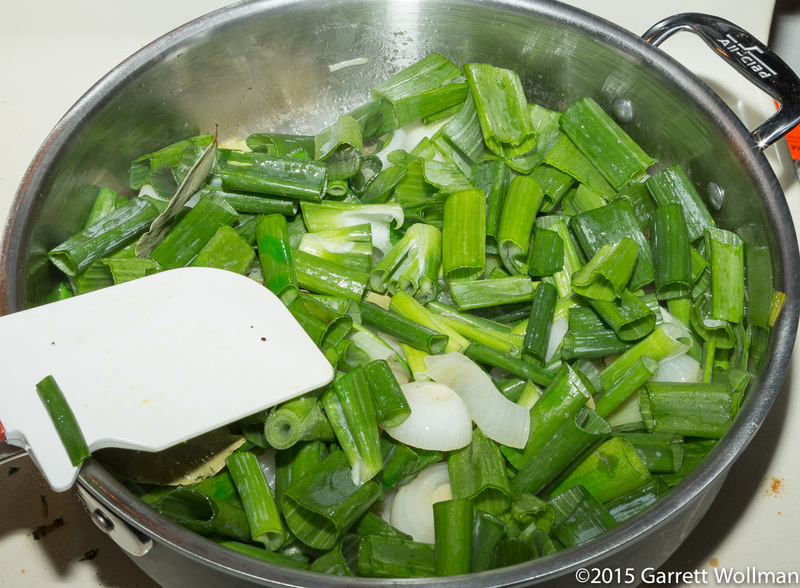 The first ingredients to go in (after the melted butter and olive oil) are the white parts of the spring onions and the cut garlic cloves; these cook, with salt and pepper, for 10 minutes or so until softened. In the second stage of the sweat, we add the green parts of the onions and the three bay leaves, and let these cook for another ten minutes. Now the peas and zucchini are added to the sweat. These take very little time to cook, only five minutes. 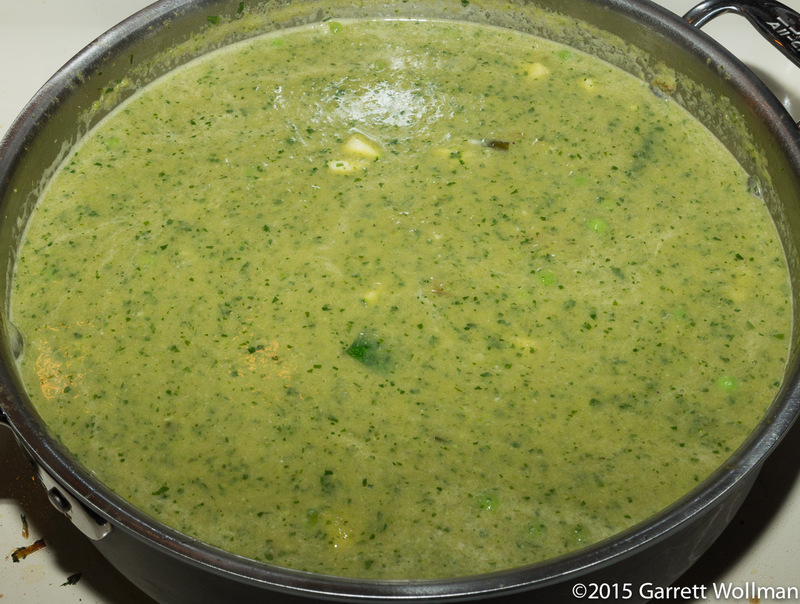 This soup is emulsified using an immersion blender. To ensure that it retains some texture, half of the vegetables are removed from the pan at this stage, while the broth is brought to a boil with the other half of the veggies and simmered for just a few minutes. 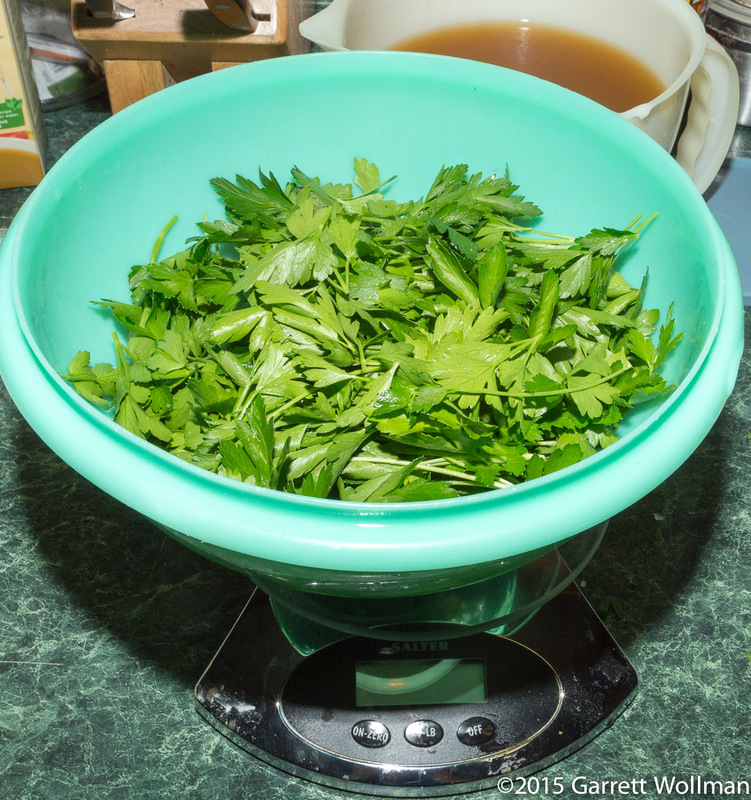 This is what 80 grams of parsley leaves looks like. It’s a lot, and it took a good ten minutes just to separate the leaves from the stems (and I didn’t do an especially careful job of that). 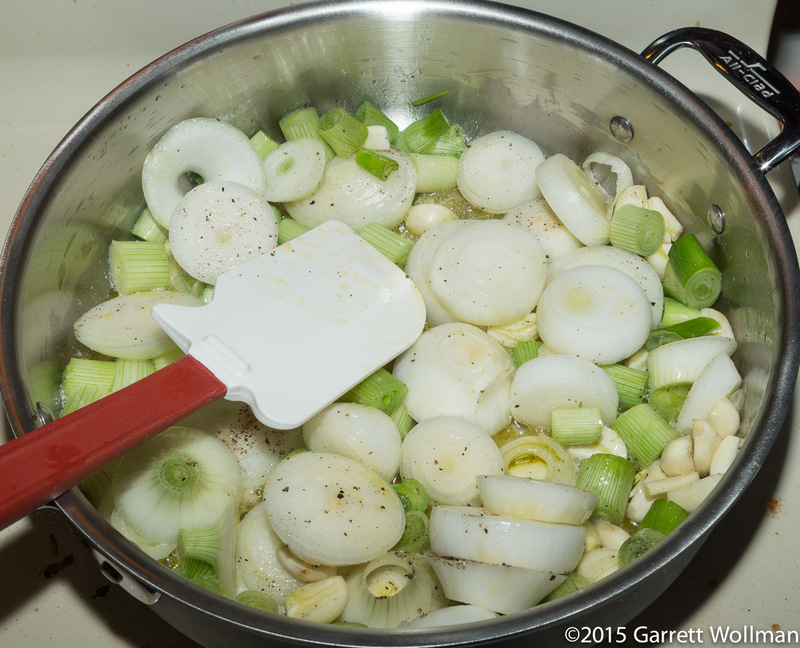 Thankfully, this part can be overlapped with the sweating of the onions and other vegetables. After the soup base is blended, the reserved half of the vegetables is added back in and heated through, and then the kashk or substitute is stirred in and it’s ready to serve. The recipe headnote says “serves four to six”; the actual yield, as I made it, was about 2.4 kg or just over 5 pounds. I generally consider a pound to be a more than adequate serving of soup; I could easily get six servings out of this recipe. For service, since I didn’t have kashk, Ottolenghi says to add a teaspoon of crème fraîche to the bowl; on top, there is some chopped mint (which I used, even though I despise spearmint, in deference to the recipe) and freshly grated lemon zest. I passed on the drizzle of olive oil Ottolenghi calls for, which really doesn’t do anything for me other than add calories, and (unlike the crème fraîche) is not included in the nutrition calculations below. Based on five 480-gram servings, including crème fraîche, mint, and lemon zest added to each bowl at serving time. 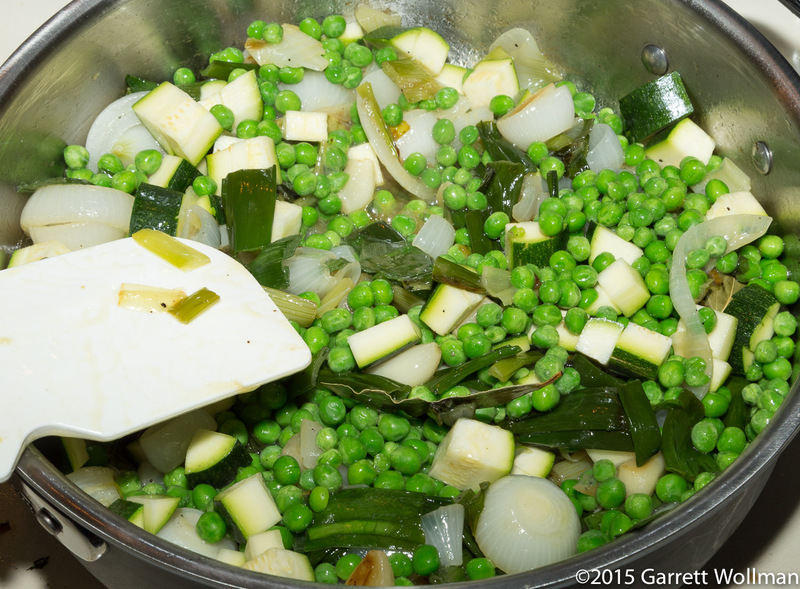 Gallery | This entry was posted in Food and tagged garlic, onions, peas, recipe, soup, Yotam Ottolenghi. Bookmark the permalink.